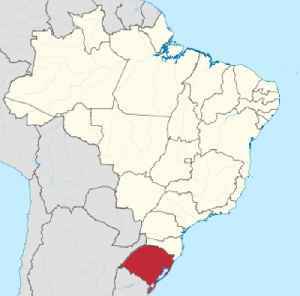 Rio Grande do Sul is a state located in the southern region of Brazil. It is the fifth most populous state and the ninth largest by area. Located in the southernmost part of the country, Rio Grande do Sul is bordered clockwise by Santa Catarina to the north and northeast, the Atlantic Ocean to the east, the Uruguayan departments of Rocha, Treinta y Tres, Cerro Largo, Rivera and Artigas to the south and southwest, and the Argentine provinces of Corrientes and Misiones to the west and northwest. The capital and largest city is Porto Alegre. The state has the highest life expectancy in Brazil, and the crime rate is considered to be low.